Who is important for Viral? Who he loves? Who he hates? Viral is a warm and stubborn character that has a lot of sides of his personality, and obviously there are special people that made him who he is now, and surely, that became different thanks to him. Viral considers Kamina a sort of rival for him. A lot of sides of their personlity are the same, and also, a lot are the opposite, but watching the second episode of the series is natural understand that Viral and Kamina will be rival. Sword against sword, beast against beast XD, human side against human side, but different ideas and goals. Kamina wants to creat a world in which all the people can live happily and not in the subsoil. Viral wants the same thing for the Beastmen, but his goal includes that humans haven't overpowered Beastmen like the made until that moment. Their rivalry is very light on in the first episodes, even with their GunMan. 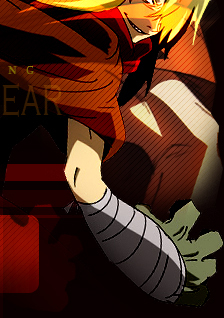 usually Viral is the one that remains enjuired by their fights, but he always returns to face Kamina again and again. Kamina's death is a little shock for Viral. Protagonist against the first antagonist of the series. The relation between Viral and Simon has a real evolution, because they're opponents, prison comrades and at least, partners in battle. It's very interesting and spectacular look at their development. 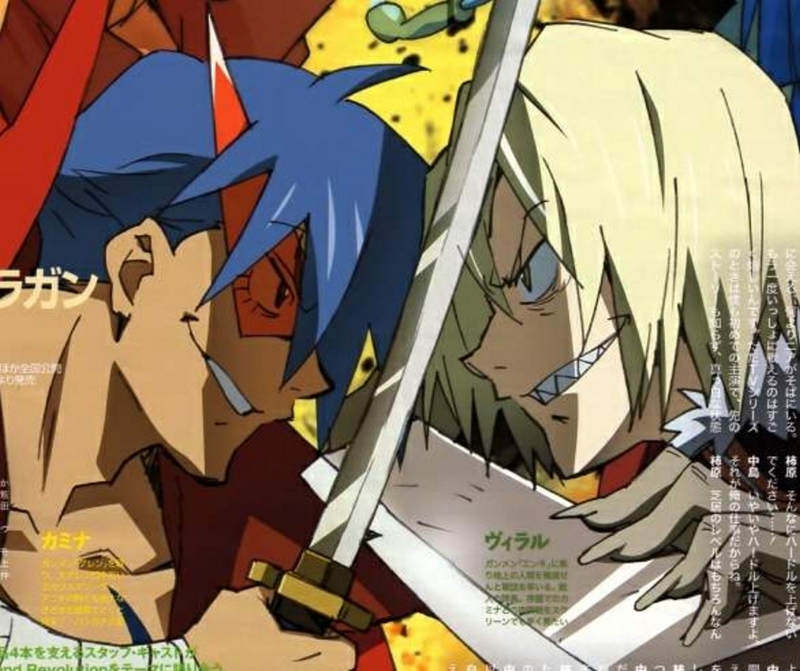 As for Kamina, they have different points-of-view and different goals, but in the last battle they understand that the only thing to do is to save the Earth from destruction, so they decide to leave the past rancours and to fight together. 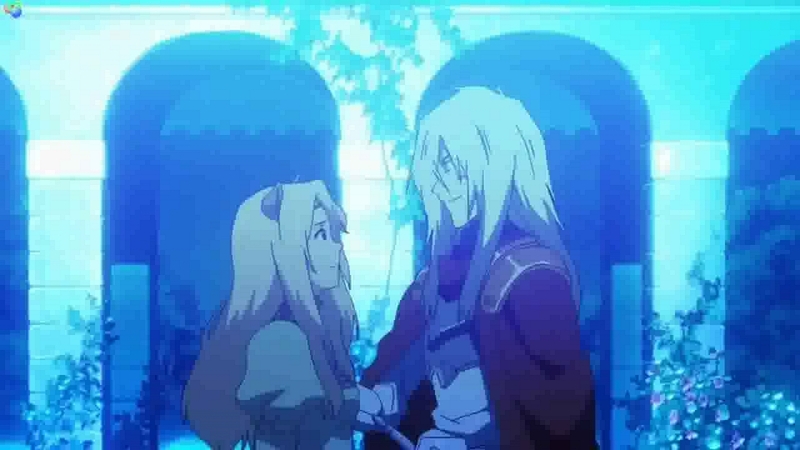 They're so cool together and their partnership is one of the most great of the series! 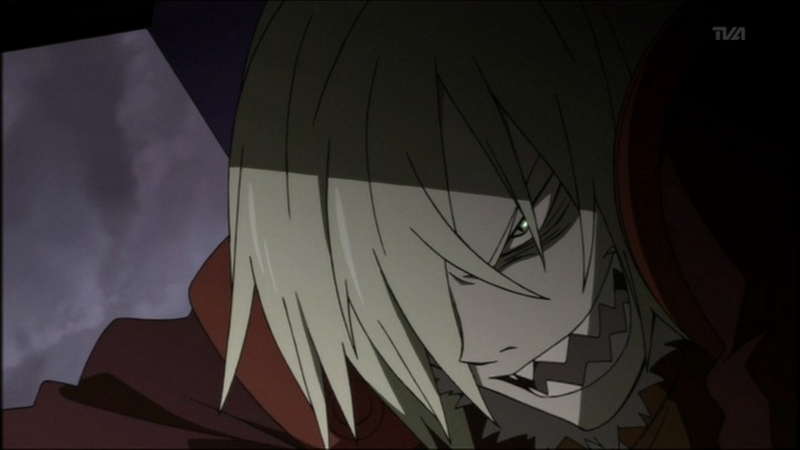 After the final battle Simon makes Viral commanders of the Gurren Brigates, so this is the major prove to understand that now they entrust in the other one. In the moment in which Viral turn back to his family and he sees Simon and the Gurren into the sky, the decides to join Simon again. Definitely, they're friends. Viral was always devoted to Adiane. He called her "Adiane-sama" and he always thought to her saveness even when her stubborness obligated her to fight and sight against Gurren Brigate even if obviously they're much stronger than her. Viral tries to save her a lot of times but it's useless, because she loses her life and he cries bitter tears for her. That moments are the ones that prove to us that Viral' feelings are strong and he isn't the canonic evil character. We can say that the only relation between them is that Viral joined him because he wanted to know the truth about Beastmen. He's the first one that had the courage to ask it to Lordgenome, and in the last part of the first 16 episodes Lordgenome decides to tell him the truth, before his death. So Viral knows that his body is immortal and that creatures like him weren't created to be overpowered by humans but to live together with them. To create a word in which both of them can live together, happily. Tsuuma is Viral's wife and his role is something that nobody thought to ever seen beside Viral XD ! A sweet, kind and adorable Beastgirl that loves him with all the heart and that share a cute daughter with him. Their relation is better treated in the Special of the DVD: Viral's Sweet Dream, where we can know her and the daughter. Also, she's always the heronie in Viral's Parallel Works and they're a cute couple! He very different when ie together with her and his sincere and sweet smile is the prove.